The Internal Revenue Service has reminded taxpayers that they need to report any income they earn from virtual currency transactions on their tax returns. The IRS forced one of the largest cryptocurrency exchanges in the world, Coin base, to send information on 13,000 of its users to the IRS last month after a protracted legal battle involving the use of John Doe summonses. 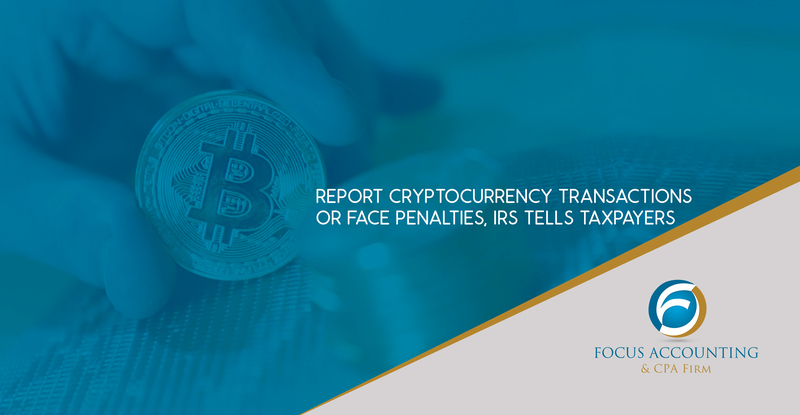 People engaged in transactions involving Bitcoin, Ethereum and other digital currencies are supposed to report to the IRS. The IRS pointed out that cryptocurrency transactions are taxable by law, similar to transactions in any other type of property. In 2014, the IRS had issued guidance in Notice 2014-21, spelling out the agency’s position on digital currency transactions for taxpayers and tax preparers. Connect with one of our tax advisors at 415-644-5933.